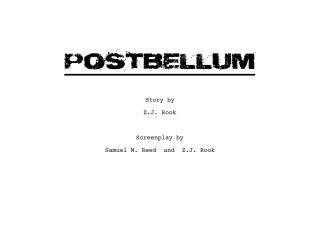 Postbellum means "existing after a war." This film delves into that meaning through the mind & heart of our main character, Corporal Sean Gara. A late 20's physically disabled veteran who is misunderstood by society and is pressured by his love ones to get help when he might be the only one who sees things clearly. Using my own experiences of losing my only brother, a 4 year battle with cancer that resulted in the amputation of my arm, and current events we explore postbellum. Sorry to ask JREED but in that description where it says "lost my own brother to cancer", that isn't you having lost your own brother is it? No, Migs, that'd be my friend, thanks anyways though. He actually lost part of his arm due to cancer, his brother died a long time ago (not from cancer), when we were kids.